Plastic surgery patients were getting infections with antibiotic resistant bacteria, and no one knew why. UConn microbiologists found the answer in a leech's gut. Their research, published today in mBio, provides proof that tiny levels of antibiotics found in the environment can encourage bacterial resistance. UConn microbiologist Joerg Graf from the Department of Molecular and Cell Biology is intimately familiar with leech guts. He's examined the contents of thousands of them over the years. He studies how bacteria can live inside animals' digestive tracts without making the animals sick, and leeches are a perfect study case; with only two major types of bacteria inside them, the relationship is relatively simple. Leeches raised by medical suppliers, leeches captured in Europe, leeches his students gathered from the ponds behind W lot on the UConn campus, Graf knows them all, and all their quirks. He thought he knew the bacteria in their digestive systems just as well. But in 2011, he got a nasty surprise. One of his graduate students, Sophie Colston, was having trouble growing bacteria. It was a strain of Aeromonas that usually does really well in leeches. They would feed the Aeromonas strain to a leech and later on check how well the strain was growing in its gut. This time, the Aeromonas strain was having trouble. Lidia Beka, another graduate student in his lab, pursued the cause. "For some reason, it was having a tough time surviving in its native habitat," says Beka. At the same time, plastic surgeons began to report problems with patients getting infected with Aeromonas bacteria resistant to ciprofloxacin, an important antibiotic. The patients had all been treated with leeches to improve blood flow at surgical sites. Aeromonas bacteria are a large and diverse group, and many of them can live on blood, which means they could cause infections if they get into wounds. But normally they are easily treated with ciprofloxacin, and there would be no source of Cipro-resistant Aeromonas in a hospital. 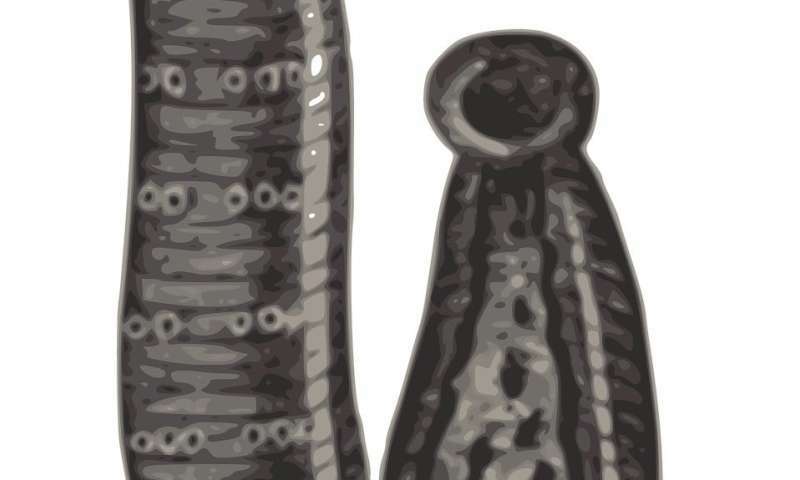 The drug-resistant Aeromonas had to have come from the leeches—but how? The animals are raised on specialty farms, fed a controlled diet and used only once, on a single patient. "Without ever having been in a hospital, without having seen a patient, these leeches contained Cipro-resistant bacteria," Graf said. When Graf receives leeches, he keeps them in jars covered with cheese cloth and keeps the jars in the refrigerator to simulate winter. When the leeches emerge from cold storage, they're hungry. They want blood. And they're not picky about where it comes from. Leeches are equal opportunity blood suckers. So when the mad cow disease outbreak made it undesirable to use cattle blood, a major medical leech farmer in Europe switched to feeding the leeches poultry blood instead. That switch gave Graf and his lab a clue. What if the chicken blood was contaminated with antibiotics? They analyzed the gut contents of leeches from the farm that fed poultry blood, and found traces of both ciprofloxacin and enrofloxacin, cipro's veterinary analog. But the amount of antibiotic present was vanishingly low. Just around 0.01 micrograms per milliliter, four hundred times less than the concentration a bacteria must survive in order to be considered "resistant". Still, leeches from other farms—in whose guts the test strain of Aeromonas still grew fine—didn't have any detectable antibiotics in their intestines. Could such low levels of Cipro, hundredths of a microgram, really be selecting for antibiotic resistance? Graf and Beka and their colleagues decided to find out. They isolated strains of Aeromonas from leeches contaminated with antibiotics, and sequenced their genomes. Two colleagues, Matt Fullmer and Peter Gogarten, confirmed that they contained the three bits of DNA, two genes with mutations and a plasmid, necessary for resistance to Cipro. Having mutations in genes essential for DNA replication is biologically costly. The bacteria would only keep them if they were useful for survival. And indeed, when the Cipro-resistant Aeromonas were grown alongside the test strain of Aeromonas in a clean lab medium or inside a leech, the test strain grew all over them. But if there was even a tiny bit of antibiotic added into the mix, as low as 0.01 micrograms/mL, the Cipro-resistant variety dominated. "This was the first time such low levels of antibiotics were observed doing this in the natural environment. Levels of antibiotic 100x below the clinical breakpoint allowed the resistance bacteria to outgrow the sensitive bacteria a million-fold!" Graf says. This is worrisome, because ciprofloxacin and related drugs don't breakdown very well in the environment. They persist. They're found in hospital wastewater, in effluent from pharmaceutical manufacturers and farms, and even sometimes in sewage. And, apparently, in poultry blood. The use of antibiotics has been banned in poultry farms in the US, but not in Europe. And because antibiotics are present in hospital, pharma and sewage wastewater at such low levels, these other sources are generally unregulated. But as the research of Graf, Beka, and their colleagues shows, these low levels matter. If we don't clean up our waste disposal practices, we risk making some of our most important antibiotics useless.